This year’s early music seminar is dedicated to notions of music in the lifetime’s work of Galileo Galilei (1564-1642), whose brother, uncle and children were all musicians, while his father was the celebrated music theoretician, lutist and composer Vincenzo Galilei. Among the letters written by Galileo to his friend Ludovico Cardi, a Florentine artist (he drafted the first artistic images of lunar craters) who had settled in Rome in 1604, there is a particularly celebrated missive dealing with theoretical art issues. In this letter Galileo compares painting and sculpture and then both of them to drama and music. Surprisingly, the scientist expresses a preference for singing rather than instrumental music, claiming it reaches higher degrees of subliminality. This sets him countercurrent to most musicians and critics of his day. Like his father Vincenzo, they were more concerned with the new performance practices of recitar cantando and the fast-developing forms of opera. 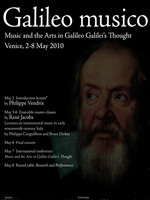 Galileo’s ideas raise the issue of the “emulation of the human voice” by instrumentalists – as promulgated in the agenda of almost all teaching texts for instruments in the early 17th century – and force us to reconsider the concepts of “mimesis” and “sublimation” as regards their aesthetic and, most significantly, rhetorical implications.The seminar will analyse the repertoire referred to by Galileo (arias, opera recitatives and Italian sonatas from 1600 to 1610) in the context of the history of theory and performing in music and drama. For this purpose, two groups of young scholarship-holders (a total of six or seven students) will be invited to the seminar: a purely instrumental ensemble (possibly made up of a violin, cornett and a duo-trio of basso continuo), and two soloist singers, accompanied by the music assistants at the seminar (a keyboard player, a lutist and a cellist). The groups will be guided by the principal teacher, René Jacobs, a leading authority in the field of 17th-century opera and an expert on period instrumental repertoires. René Jacobs will be joined by two musician-musicologists: Philippe Canguilhem and Bruce Dickey. The first, an expert on the work of Vincenzo Galilei, will illustrate the young Galileo’s musical education. The second, a world-renowned cornettist will report on the state of current research into Venetian instrumental repertories from around 1610. Both musicians will also be among the group of eight-nine speakers at the International Study Day to be held on Friday, 7 May.